It was so nice to see some of you out last night at the Parent Mixer. Thank you to Juliette, Robyn, and Daniela for organizing the event. You should have received an email from the class parents about our upcoming Class Play Date. I hope that everyone can make it for some fun and bonding in the park on Sunday, October 28 from 2-4. I hope that the homework routine is going smoothly for everyone. Some students have passed their notebooks in early and so far it looks like everyone is putting in good effort and following the directions and checklist carefully. Please let me know if you are having any issues at home around homework. Most students published their first poems today. They are especially excited about using the computers to type their poetry for publication. Every Friday we have a poetry writing time and students are compiling an anthology of poems that they are studying and writing. The first poem that we looked at is called If I Were in Charge of the World, and students wrote poems on that same topic. They had lots of fun and creative ideas for what they would do if they were in charge. 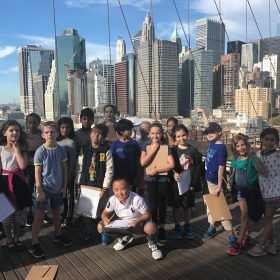 This week we compiled all of the notes that groups had taken while on the Brooklyn Bridge last week. We have been looking at maps of the five boroughs and discussing the geography of New York City. We also began a read aloud book about the Brooklyn Bridge. 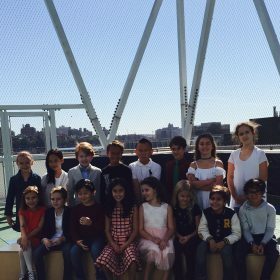 Please enjoy these photos of our class together with Erin and Alina’s first grade. This class will be our buddy class all year. We met with the first graders yesterday and kids got to know their buddies a bit. It was very sweet. 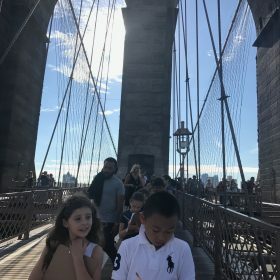 We all had a great time on this week’s walking trip on the Brooklyn Bridge and at our first Family Visit. A big thank you to our parent chaperones on this field trip: Sophie, Luciana, Martin, Freya, and Liat. 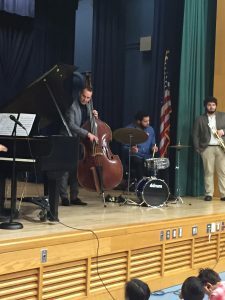 Please enjoy some photos from both of the these events. 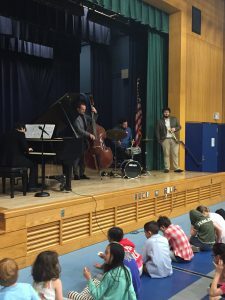 Students are always welcome (and encouraged) to go above and beyond what is assigned– do more, get creative, etc. In my view, the goal of the homework routine in third grade is for kids to see themselves as learners/students outside of the classroom, and for them to develop a good home work ethic. Homework is also a good way to work on independence and responsibility at home. Students are still expected to read for thirty minutes every night. We had our first visit to the school library today and we will be visiting the library every Friday this year. Please remember that your child should have only one independent reading book going at all times. This book can be from the classroom library, the school library, or from home. The book should travel back and forth between home and school every day. Next week students will be assigned to reading groups. This will mean that each child will be reading a book with me some of the time during class. It will be way too overwhelming for anyone to have more than these two books going at once. I hope that everyone enjoys the long weekend. I look forward to seeing everyone back at school on Tuesday! With this first five-day week of school we are now fully in the swing of things in 3-326! We had a productive week and we have a lot to look forward to next week. Thank you to everyone who volunteered to chaperone our upcoming trip to walk on the Brooklyn Bridge. I am still missing a few permission slips. Please be sure that your child has on good walking shoes this Tuesday. We are all looking forward to welcoming you into our classroom for the first Family Visit of the year. Please join us on Wednesday at 8:30 for a reading visit. If you won’t be able to make it, please let me know in advance so that I can make a plan for your child. Students have been working very hard during writing time. Most students are in the revision stage of the writing process and will soon be publishing. We have also started focusing on poetry during writing time on Fridays. Today we focused on the use of stanzas and repetition in poems. In math we have been focusing on the range of strategies that can be used for solving subtraction problems. We have also been presenting solutions to complex word problems in front of the class. The photos below show students working in pairs to produce posters of their work for sharing. The first homework choice board will go home on Friday, October 5. In the meantime, please be sure that your child is reading for at least 30 minutes every night. If this isn’t happening, send me an email so that I can help out with the routine. Enjoy a beautiful fall weekend! It was a pleasure to see so many of you at Curriculum Night earlier this week. I am enjoying reading the parent questionnaires that you filled out. I am learning so many new things about kids in the class. If you weren’t able to make it on Monday evening, your child will be bringing home a copy of the questionnaire for you to complete. A big thank you to our new Class Parents for taking on the role this year. We have Juliette (Luc’s mother), Robyn (Leonardo’s mother), and Daniela (Thomas’s mother). After generating lots of ideas in their Writer’s Notebooks, students have all selected a topic for their first published pieces of the year. We will be learning about organization and development next week as kids began to draft their stories. We have been talking a lot about non-fiction books in reading. Beginning next week, you may notice that your child is bringing home non-fiction selections for a while. It’s great for them to read across many genres and to see that there are so many cool non-fiction books out there! These books tend to be shorter, so students may read more than one book in thirty minutes. In math we have been talking about computational strategies and the importance of demonstrating accuracy, flexibility and efficiency when choosing a strategy. In second grade students were exposed to a variety of strategies for addition and subtraction and now is the time to gain a deeper understanding of how to thoughtfully match strategies to problems. Our first Family Visit of the year is scheduled for Tuesday, October 2 at 8:45. We will be finished by 9:15. The focus for the visit will be reading. Please enjoy some pictures taken in the cafeteria at lunch today! Have a great weekend. We had a fun and productive three-day week in 3-326. Over the next couple of weeks I will be formally assessing students in all of the subject areas. This week students completed an “On-Demand” writing assignment which gives me the opportunity to see individual students’ strengths and weaknesses in writing. Overall, the class is very enthusiastic about writing and their stamina is excellent! You can see some photos below of students decorating their Writer’s Notebooks. Thank you to everyone who donated supplies to the class for this project. The kids loved personalizing these books. Having a special notebook to write in is a big motivator for them to do thoughtful and careful writing. In math we learned a game called Nim Jr. You can ask your child to show you how to play– all you need are ten coins or small objects. We played this game so that we could begin to talk about the concept of strategy and so that kids could practice articulating strategic thinking in writing. I have also included some photos of students setting up our classroom library. We have been talking a lot about different ways to organize books and genres and sub-genres that can be found in our collection of books. You will have to check out how organized our library is on Monday evening. Nesha received a lot of interest in Crochet Club from students in our class. The list is set and the first meeting is Thursday, September 20. Nesha will be dismissing the kids from the club on Thursday afternoons. I am looking forward to seeing you all on Monday evening for Curriculum Night. Have a wonderful weekend! I couldn’t imagine a smoother transition from summer vacation to the start of school– your kids are amazing! I feel very fortunate to have a class full of enthusiastic, kind, and respectful students. I know that it is going to be a great year! We spent the past three days getting to know each other and building community. You may have heard about The Marshmallow Challenge and The Cup Pyramid Challenge (see photos below). Kids had a blast building structures together and then thinking about how they worked together effectively to solve a problem. We also began to establish routines and expectations for reading, writing, and math time. Students have all selected independent reading books. Your child should be reading the same book at home and at school, so please remind her/him to pack the book each day. We have discussed the importance of finding “Just Right” books and I have been conferring with students to be sure that each child is choosing appropriate books. I will have gotten to all students to discuss book choices by the end of next week. Students should now be back in the groove of reading for 20-30 minutes each night. During writing time we have been filling our Writer’s Notebooks with “short writes” that will be used as inspiration for future writing pieces. When we return to school after the four-day break we will be decorating/personalizing our Writer’s Notebooks. Please send in old magazines (appropriate for kids) for cutting up, stickers, duck tape, family photos, and any other supplies that would work for making covers. Other highlights from our first week back include starting the book Frindle during read aloud time, hearing about summer vacations, trying out the juggling greeting during Morning Meeting, and sharing “roses,” “buds,” and “thorns” at Closing Circle. Nesha will be running the Crochet Club again for third graders during choice time. Please read her note below so that you can sign up if your child is interested. I hope that everyone has a relaxing weekend. I look forward to seeing the class again on Wednesday. Signing up this year will be a lottery. Please send your child’s name and class to nhall@health.nyc.gov and not to the teachers! Each class gets 10 spots. Names will be pulled on Thursday, September 13th at 2:40 p.m. and you will be notified then. Please remind/tell your son or daughter that it is a commitment. While the class is done as one of their work time choices, it is not a choice they can change weekly. DO NOT purchase anything until you receive confirmation from me that your child is in the class. You may have seen me around at Peck Slip. For the last two years I have taught fourth grade there. This will be my first year in third grade at Peck Slip– so we’re all new to this together! Before coming to Peck Slip, I taught at an international school in Hong Kong (see if you can find HK on a map). 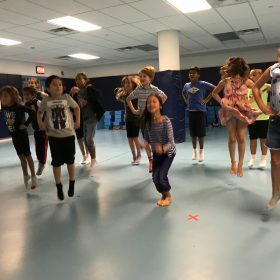 Before that I taught for several years in New York City, in Tribeca and in Harlem, and prior to that I taught for many years in the Boston area. I can honestly say that, after teaching at many different schools, Peck Slip is the happiest school that I have worked at. I’m proud to call it my school! 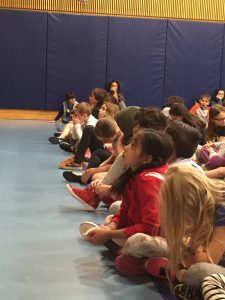 When I am not spending time in the classroom I can be found hanging out with my family, reading, going to shows, running in the park, doing craft projects, and learning new magic tricks (I will share some of these with you this year!). I live in Brooklyn with my husband and my two sons, David and Andy (ages 12 and 10). David is going into seventh grade and Andy will be in fifth grade. This will be the first year that both of my kids will be older than the kids I teach– it makes me feel old! This summer I have been enjoying as much time as possible outside. I was in California for a couple of weeks and I got to do lots of hiking, which I loved. I spent August on Fire Island where I was on the beach most afternoons with my family, jumping in the waves and reading books. 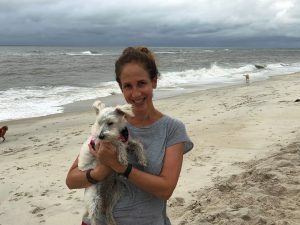 Dogs are only allowed on the beach there in the early morning, so another fun activity was taking my puppy to meet up with her dog friends so that they could chase each other, dip in the water, and roll in the sand (a bath always followed!). I am looking forward to all of the interesting topics that we will learn about this year. In addition to becoming stronger readers, writers, and mathematicians, we also have two fascinating studies in third grade. The focus of our first study will be the Brooklyn Bridge. We’ve all seen this New York City landmark so many times– I even walk home across it most days– but this will be our opportunity to learn all about how it got here. The subject of our other study will be the Lenape people. Have you ever wondered who lived on the land that we currently live on, hundreds of years ago? This will be our chance to learn all about the history of this area and the people who were here first. I look forward to hearing about everyone’s summer and to finding out about your goals for third grade. If you have any questions or want to contact me, please feel free to email me at rglick@schools.nyc.gov. I will be setting up our classroom the week of August 27, and I am always up for visitors if you want to stop in. See you very soon! It’s hard to believe but the school year is wrapping up – and quickly! After what feels like all of 5 minutes this year, it’s now May! Things are just FLYING by. Thank you so much for all the Teacher Appreciation Week love – we’re so grateful for your appreciation, it really means a lot! We’ve set the deadline for the final Scholastic orders as June 8 – now is a GREAT time to stock up on plenty of books for summer reading! You can place your Scholastic order via www.scholastic.com/readingclub / class code: LTKX2. 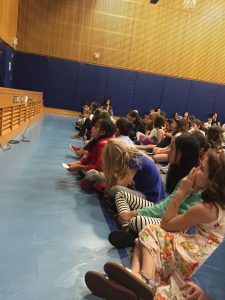 And just a heads up: Peck Slip will again be participating in the Lighthouse Guild Summer Reading Challenge; we’ll hear from the blind relative of a 5th grade family to learn just how much kids’ participation in the annual event means. We still have a lot of learning to do in these last 6 weeks of 3rd grade. In particular, our content study of the Lenape Eastern Woodland Indians is hitting full stride. Following here is an update on the last few weeks in our class community, as well as a glimpse of what our students have been busy learning. Read on for more! During the last month, we began a study of realistic fiction in both reading and writing. To kick things off, we read (and loved!) Because of Winn-Dixie by Kate DiCamillo to help us get to know characters and conflicts on a deeper level. This helped prepare us for our realistic fiction writing work. To that end, writers planned a character by deciding on a name and details that would be relevant to their story. Next, they thought about a conflict their character would encounter: character vs. character (like in Because of Winn-Dixie), character vs. self (like in an earlier read-aloud book, My Name Is Maria Isabel) or character vs. nature (also in Because of Winn-Dixie). They’re now hard at work developing their stories, combining the important ingredients learned in our narrative writing unit with our new learning about realistic fiction. communicating effectively and agreeing/disagreeing with support to back up ideas. Our class has returned to work on understanding money to help kids with mastering this valuable life concept. One way to help students learn about this concept is to set up a food truck business. Why a food truck? Because it’s a real-life opportunity for kids to explore a business found in our community. Through this project, students will create a menu with dishes and prices. Then they will build a small-scale truck that includes a stove, sink and all of the items needed to create those yummy dishes, reinforcing the skills of area and perimeter. After everyone creates their food truck, students will have an opportunity to “open up” for business. Next up, we will work more on geometry, time and collecting and interpreting data. When we began our study, we learned the word “Lenape” means “ordinary” or “common” people and in our reading of Little Fox: Story of an Indian Boy by Katharine Keelor, we learned how the main character, Little Fox, got his name. We wanted our students to choose a name for the character in their upcoming historical fiction writing, to fully appreciate the meaning of the name they’ve selected. They chose names based on their own personalities and abilities as well as an animal that represents them. Later in our study of the Lenape Eastern Woodland Indians, students will ground their learning in writing historical fiction using this character that they created, each with artifacts to represent their life as a member of the Lenape tribe. As students continue to learn more about the tribe through our readings and field study, the characters will become more vivid and detailed, and their writing will showcase what they are learning about the daily life of a Lenape Eastern Woodland Indian. Already, students are bursting with ideas and questioning the roles of the tribe members. We can already tell that the kids are going to have some captivating stories to share! As you know, we began our work with Catherine Teegarden from the Center for Architecture. Peck Slip’s fabulous PTA makes this residency possible, and we couldn’t be more grateful to them for giving us this opportunity! Students will learn about the design and construction of native shelters and everyday objects that enabled the Lenape to live in NYC when it was a forested area. Additional information about Native American life, such as local flora and fauna, social organizations and customs, and daily activities will also be incorporated into their work. You’ll see their final projects on display at our content study celebration! Our Word Study work has continued with kids learning 5 new words each week, along with a spelling pattern. In other news, you may have heard that we began learning to write in cursive. The kids are VERY excited about this new development in the classroom. We’re following the “Handwriting Without Tears” approach (which Peck Slip kids learned for correct printing of letters in kindergarten), which begins with lowercase letters. So far, we’ve learned: c, a, d, g, h, t and p.